Bako National Park is located on the beautiful Muara Tebas Peninsula. It is the oldest and smallest national park in Sarawak but with a variety of habitats and landscapes. There are beaches and sandstone cliffs along the coastline as well as rainforest, jungle streams and waterfalls with plenty of trekking trails for exploration. The wildlife living in the park include proboscis and silver leaf monkeys, long tail macaques, wild boars and monitor lizards. The Kinabatangan River is the longest in Borneo and as it meanders through the Sukau Rainforest it creates a flood plain that makes it an excellent environment for wildlife viewing. River cruises along the Kinabatangan enable spotting of proboscis and leaf monkeys, orangutans, Bornean gibbon, Asian pygmy elephants, long tailed macaques, sun bears, clouded leopards and barking deer, as well as over 200 bird species including frogmouth, hornbill, egret and oriole. The Danum Valley is the largest protected lowland rainforest area in Asia, measuring some 430 km². It is home to 274 bird species and 110 mammal species, many of which are rare and endangered. From a base at the Borneo Rainforest Lodge, there are many trails through the jungle that allow you to look for orangutans, giant flying squirrels, gibbons, bearded wild boars, flying frogs, Asian elephant and the extremely endangered Sumatran rhinoceros. Night drives may enable spotting of nocturnal species such as civet, sambar deer, leopard cat, slow loris or clouded leopard. 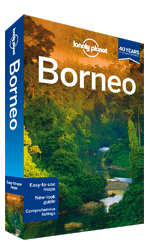 Organised group tours: Click here to see 4 tours to Borneo which may include Borneo Rainforest Safaris.